Golden decade Losing its sheen? Between 2005 and 2015 gold surged from Rs6,000 to Rs27,000 per 10 gm, at CAGR of 16.23 per cent. Traditionally, India's love for gold as an investment option has been legendary. And, the yellow metal has, so far, not disappointed the Indian investor. For instance, between 2005 and 2015 gold surged from Rs6,000 to Rs27,000 per 10 gm, yielding an impressive compounded annual growth rate (CAGR) of 16.23 per cent. Says Naveen Mathur, Associate Director, Commodities and Currencies, Angel Commodity Broking: "The steepest part of the rally occurred between 2010 and 2013 due to the depreciation of the US dollar and falling short-term real interest rates. This enhanced the attractiveness of commodities, pushing gold prices to record high levels." The seeds of this rally, however, were sown in 2008. In the wake of the Lehman Brothers crisis, the US Federal Reserve initiated its bond buying programme, or quantitative easing (QE), in November 2008, pumping in a record $100 billion in the economy within a span of just 18 months. As a result, gold prices surged by over 50 per cent riding on investment-led demand. Mathur says the success of Q1, QE2 and QE3 unleashed a wave of liquidity in the market which boosted gold prices to touch a record high of $1,921.17 an ounce in 2011. 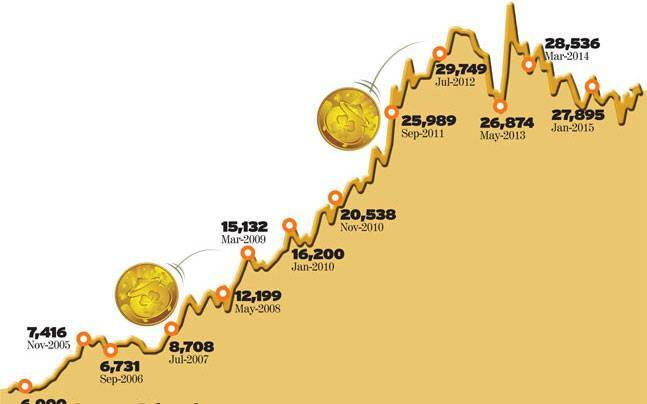 In August 2013, gold prices peaked to touch the `35,074 per 10 gm mark on the Multi Commodity Exchange of India. Subsequently, with the fears of a collapse of the US dollar and Euro waning the 12-year bull run in gold prices ended. It was a matter of great cheer for those who had made bearish bets on the metal in 2014/2015. In short, the events which occurred in the US, including the policies of its central bank, formed the bedrock for driving the price trajectory. If you thought their influence was over, you are grossly mistaken. Gold has always been considered as a hedge against inflation and political unrest. Therefore, financial advisors recommend 5 per cent to 10 per cent allocation to the yellow metal to balance out an investor's portfolio. However, over the past one-year gold has been increasingly losing its safe haven status. Three months back when China devalued its currency, crude oil and equity markets across the globe went into a tailspin, losing 10-15 per cent. In such a scenario, it was widely expected that gold prices would rally. But, to everyone's dismay, the yellow metal inched higher by only 6 per cent during the period. Gold which has been historically known to react sharply to politically upheavals moved in a very narrow range even on reports that the US was preparing for military action in Syria. Commodity experts are of the view that if gold continues to behave likewise it will very soon be a challenge for it to maintain its safe haven status. However, it is too early to write away the metal as well. Even though gold is moving in line with the waiting game of the US Federal Reserve, the Chair of the central bank Janet Yellen has time and again indicated that a rate hike is on the cards. If not by the end of 2015, a hike can be expected by the 2016. Once the rate hikes take place, inflation is expected to make a comeback, and drive gold prices up. Another aspect that is likely to support the upward movement in gold prices is the bearish trend seen in the US dollar, which is positive for gold. SPDR Gold Trust, the biggest exchange-traded fund (ETF) backed by gold, saw the sharpest surge in nine months, at the start of this month. India and China have thus far been the top buyers fuelling the gold rally. However, for the last few years, gold consumption in both countries has been on a decline. China has been battling with its own set of economic troubles while consumers in India are fence sitting, expecting the prices to decline further. The effect of the same has been visible in the recently released World Gold Council data. For the second quarter of the year, global gold demand dropped 12 per cent, hitting a six-year low of 914.9 tonnes, primarily due to a decline in consumption from India and China. However, with the wedding and festive season underway in India, demand for gold jewellery is expected to rise because buying the yellow metal is considered to be auspicious during this season. But commodity analysts are skeptical as to how the next three months will pan out in terms of demand. Says Kunal Shah, Head of Commodities Research at Nirmal Bang: "Demand is likely to be tepid this year as gold has been giving negative returns over the last two years. Rural buying too will not be supportive for the price due to scanty rains affecting harvest." In India, farmers are the biggest consumers of gold and account for almost two-thirds of gold purchases. This year, lower-than-normal monsoon rainfall has strained rural income leading to sluggish demand from their end. From the retail investor's perspective, too, there is hardly any interest. According to Association of Mutual Funds of India (AMFI) data, underperformance by gold as an asset class has clearly dented investor sentiment. Gold ETFs lost shine for the third straight quarter. In the last quarter, 8,739 folios were closed as compared to 4,467 folios in the previous quarter. In the recent past, gold import alone accounted to nearly 30 per cent of India's trade deficit. With nearly 20,000 tonnes of gold lying idle in private holdings, the Modi government has rolled out schemes with a view to monitise some of it. In the Union Budget 2015/16, Finance Minister Arun Jaitley proposed a gold monetisation scheme, which would replace existing schemes, including Gold Deposit and Gold Metal Loan Schemes. Through this scheme, the depositors of gold would earn interest. Recently, the Reserve Bank of India (RBI) had issued directions for banks to start implementing the same. The central bank has decided that interest and principal payments on these deposits will be denominated in gold and that banks can use gold stock as part of their statutory liquidity ratio (SLR) requirement. The exact date of implementation is likely to be announced by the RBI soon. Besides, the finance minster had also announced the formation of an alternate financial asset in the form of a sovereign gold bond. This scheme is positioned as a credible alternative for those wanting to buy gold for investment purposes. These bonds will carry a fixed rate of interest, and can be redeemed in cash in terms of the face value of gold at the time of redemption. According to a FICCI report, Why India needs a Gold Policy, consumers are willing to part with their gold if investment and savings products are properly structured, properly marketed and properly explained. Naveen Mathur believes that gold is in a bear phase. "Our forecast for gold prices to go lower is on the assumption that the US economy is improving consistently and a rate hike is imminent by the US Fed. However, for gold prices to move up, the US economy will have to slow down drastically, the Euro-zone economy has to perform poorly, while all the eyes will be on the Chinese economy that is struggling to maintain its GDP growth and industrial activity. In that case gold prices have the potential to move higher towards the $1,350 mark. On the domestic bourses, the bias for gold prices would be lower towards `25,000 per 10 gm." In this scenario, spot gold prices (CMP: $1,171.3 per ounce) in the international markets can go lower towards the $1,000 mark. However, supply-side fundamentals reveal that if prices fall close to the $1,000 mark, miners could take a backseat, thereby creating a supply-side constraint. If miners actually go ahead with this move, then gold prices could sustain. However, a muted response from miners could lead to further downside pressure in gold prices, says Mathur. C.P. Krishnan, Whole Time Director, Geojit Comtrade concurs that a lot depends on how the US economy pans out and the direction in which the Federal Reserve decides to move in terms of policy rates. Any weakness in the US dollar will be beneficial for gold. Also, if the commodity cycle is downwards, one commodity alone cannot buck the trend, because there will not be many serious buyers. The moment gold touches $1,200 an ounce, selling will be visible, while $1,080 remains as a strong floor for the time being. If either of the level is breached convincingly, then we can say that there is a change in trend. Till then the yellow metal is likely to trade in this band. However, Chirag Mehta, Fund Manager, Commodities, Quantum Mutual Fund is upbeat. He says clients must hold at least 10-15 per cent of their portfolio in gold. His optimism stems from the fact that gold tends to outperform other asset classes during volatile times. Even in times of negative real returns, gold stays true to being a store of value for investors.